If inhaled, asbestos fibers can cause diseases that harm the respiratory system. Some inhaled fibers are trapped by the mucous in the breathing passageways or in nasal hair. The body expels a large percentage of these trapped fibers. However, since many of the asbestos fibers in the air are smaller than 1/1000 the size of a human hair, these extremely small fibers escape the body's initial defense systems and can penetrate deep into the lungs. A human inhaling these small fibers usually will not experience any immediate symptoms, such as sneezing or itching. These fibers, which lodge deep in the lungs, can remain there for years before any symptoms of disease begin to appear. Many of the World War II shipyard workers exposed to asbestos did not manifest any disease symptoms for decades after initial exposure. Lung Cancer: Humans exposed to asbestos are calculated to be at five times greater risk of contracting lung cancer than the general population. If a person smokes, the risk increases by 50 times over that of the general population. 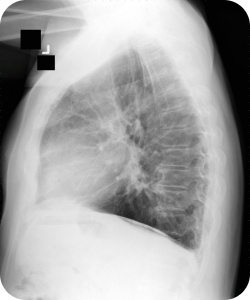 Asbestosis: Asbestosis is scarring of the lung tissue that leads to shortness of breath. In some cases, the tissue is so severely scarred that the person cannot get enough oxygen to walk and perform normal daily activities. This condition usually occurs in those who were exposed to prolonged high levels of asbestos. Mesothelioma: Mesothelioma is a cancer of the lining of the abdominal cavity or chest. Minimal amounts of exposure to asbestos can lead to this condition. Smoking can exacerbate this condition and increases the risk dramatically. Not all people who are exposed to small amounts of asbestos develop health problems. However, after being exposed to asbestos fibers, the chances of getting some serious respiratory illness is much greater than prior to the exposure. Although exposure to asbestos fibers through inhalation is deemed the primary method of exposure giving rise to disease, some medical experts also attribute certain forms of stomach, colon, and rectal cancers to the ingestion of asbestos fibers. The scientific evidence seems to indicate that people exposed to asbestos show higher incidents of these diseases than the general public. Whether the risk of disease is due to inhalation or ingestion, there are no safe levels of exposure to asbestos. Asbestos fibers do not break down in the body. The body has no mechanism to flush them out or remove them and they become trapped. Each exposure accumulates greater amounts of fibers that become permanently lodged which increases the risk of serious disease. 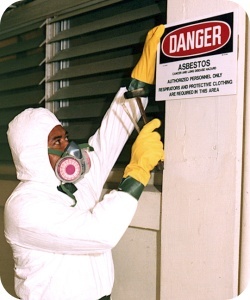 Unfortunately, the diseases caused by asbestos exposure are not readily curable. Since asbestos fibers are so small, visually identifying them in a product or material is virtually impossible. The best way to determine if asbestos is present is to recognize suspected products and materials and then have them tested for asbestos by a competent lab. Any products or materials in the following list which are found in a house built prior to 1978 should be viewed as suspect. Asbestos containing parts have been found in toasters, popcorn makers, broilers, slow cookers, dishwashers, refrigerators, ranges, ovens, cloths dryers, electric blankets and hair dryers. Ceiling material (textured acoustical "popcorn" ceilings and some ceiling tiles and lay-in panels). Wallboard patching, taping, and spackling compounds. Vinyl floor tiles, vinyl sheet flooring, and under sheeting/tile mastics. Pipes (use insulator blankets or foam wrapping on hot water and steam pipes). Driveways and sidewalks made from serpentine crushed rock or gravel that is made from serpentine rock. (Serpentine rock is usually glassy in texture and ranges in color from pale green to bluish-black but is most commonly dark or dull green). If a material or product has been identified as one that may contain asbestos from the list above, avoid disturbing the material. If possible, try to identify a label, installer or manufacturer. If these cannot be identified, assume that the material or item contains asbestos. The material should then be tested by an expert. Testing should be done by an expert who, after wetting the surface, removes a sample by either scraping off a small amount of material or by taking a core sample. The test sample is put into a clean container, labeled and sent to a lab for analysis. At the lab, an electron or polarizing light microscope will be used to determine the type and percentage of asbestos present in the sample. If serpentine rock is suspected as the major material in crushed gravel/rock driveways and sidewalks, a registered geologist should be consulted to identify the rock material. If serpentine rock is identified, it should be tested using Air Resource Board approved testing procedures to determine if asbestos is present. Although many people associated with construction trades can probably identify products or materials that usually contain asbestos, the only way to positively identify the presence or absence of asbestos is through a lab analysis. If asbestos is found to be present in a house after identifying and testing suspect products and/or materials, then the issue of how to deal with the identified asbestos must be addressed. Removal of the material should be considered as the last alternative.It presents the greatest risk for fiber release and is very expensive. If this option is selected, the United States Department of Environmental Qualityasbestos removal and disposal protocols and procedures should be followed during the abatement process. Trained, insured, and certified asbestos abatement professional contractors should only perform asbestos removal. The removal process will require that the entire work area be contained by a plastic barrier that is put under negative pressure created by a negative air machine. These machines, which also utilize high efficiency particulate air filters to prevent the introduction of fibers into other parts of the structure, are very costly to operate. In order to verify the structure is free from traces of friable asbestos after the abatement work has been completed, it should be tested by an independent professional. This testing procedure can also be very expensive. Some homeowners, not desiring to absorb the expense of removal by professionals, may foolishly elect to remove the asbestos themselves. If the homeowner elects to do the work, he/she may be exempt from the Department of Environmental Quality (DEQ) rules and regulations with respect to the removal of the asbestos containing material. However, the homeowner must follow the DEQ rules and regulations with respect to the disposal of the asbestos containing material. 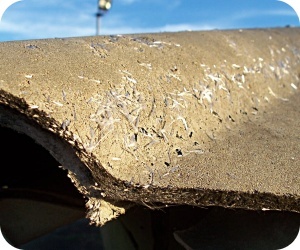 Encapsulation involves covering the asbestos containing material to prevent asbestos fiber release. EXAMPLE: If a floor cover contains asbestos, sheet over the asbestos tile with new underlayment material, then install the new floor covering, thereby permanently sealing the asbestos under the underlayment material. This is a simple and cost effective method to prevent release of asbestos fibers. Enclosure means placing an airtight barrier around the asbestos containing material. EXAMPLE: If an appliance appears to be releasing fibers into the atmosphere, insert the appliance inside a heavy plastic bag and seal the bag shut. This isolates the item in an airtight barrier thereby preventing the release of fibers into the atmosphere. Encasement involves covering the asbestos containing material with hard-setting sealing material that either binds the asbestos fibers together or coats the material so fibers are not released. EXAMPLE: The asbestos wrapping material that covers radiator heating system pipes are coated with a hard-setting sealing material that completely contains the old asbestos containing material. The new material is hard and prevents release of asbestos fibers into the air. Repair involves patching, recovering or similar methods to specific damaged areas of asbestos containing material. However, during the repair process the surrounding asbestos containing material should not be disturbed.